Today marks the day that the American Civil War officially began, 150 years ago to the day. So you think you know the Civil War ? All visitors will be pleased to hear that there is all new content now available on the website. On the menu under extras you will find Battle Reports. 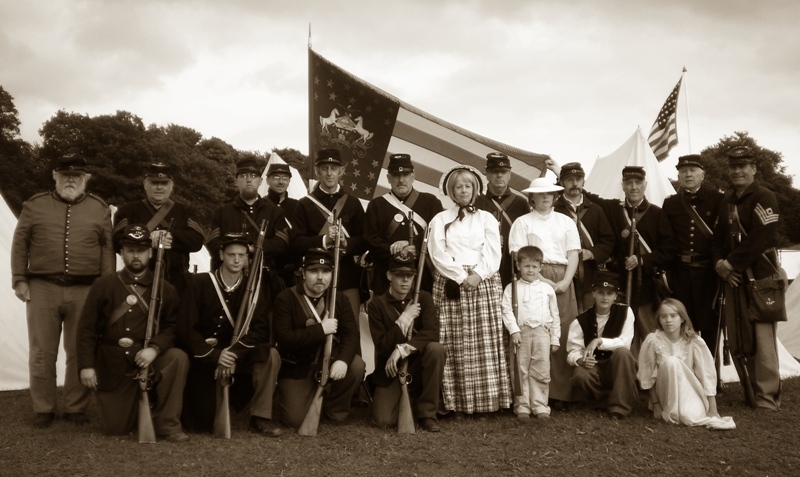 "The Corn Exchange Regiment "
Hello and welcome to the new online home of the 118th Pennsylvania Volunteer Infantry Regiment, Company C, an American Civil War re-enactment and living history group based in the UK. We are proud members of the American Civil War Society (ACWS). Our group portrays a representation of Company C of the 118th Pennsylvania Infantry Regiment who fought in the Army of the Potomac during the American Civil War. Our ranks have recently grown with the addition of members from the 2nd Wisconsin Regiment. The members of 2nd Wisconsin took the very difficult decision to 'mothball' the regiment and merge with 118th, this was not an easy decision to take and the members thought for a long period before taking this step. In a very emotional ceremony at the Sheffield Fayre the flag was officially folded and handed back to the Unit Commanders. This is not the end of the 2nd Wisconsin however as the regiment can be resurrected at any time. The 118th Pennsylvania Regiment would like to wish all those who are joining our ranks from the 2nd Wisconsin all the best and heres hoping for a long and prosperous relationship that will benefit both regiments in the future. Be sure to check all the new features of the website, including our all new gallery and guestbook. We hope to have even more new content up in the next few months, including all new members photos, more images in the gallery and a new feature whereby members will write a diary for each event. We hope you enjoy your visit to our website and we hope to see you on the battlefield in the near future. See photos of us in action and in camp in our gallery. See what other people think of our website in the Guestbook. Read about the history of the 118th Regiment, including the roster and battles in our history section. Read about the day to day goings on in our brand new forums. Music Player, see below for our brand new music player, choose the songs from the civil war era and press play. and much much more. Have a browse around, there really is something for everyone.